Move mouse over cube to manipulate the pictures. Hmmmmmm, what has happened on this day in history??????? You are currently listening to Happy Happy Birthday, Baby. If you don't hear the music, right click on the Title, and choose open. Any song highlighted in the text in BOLD BLUE, you can play by right clicking on, choosing OPEN. 1799 - Eliakim Spooner patented the seeding machine on this day. The device, like so many that we found while Christmas shopping, proved to be...impractical! 1870 - G.D. Dows patented the ornamental soda fountain this day. The marble fountain featured a double stream draft arm and sold for $225! Make than a strawberry soda with two scoops of vanilla, please! 1915 - Alexander Graham Bell in New York spoke to his assistant in San Francisco, inaugurating the first transcontinental telephone service. That first conversation went something like this: "The number you have reached is not in service or has been disconnected, at the request of the customer. Thank you for using AT&T." 1927 - Jack Benny married Sadye Marks on this day. You thought he married Mary Livingstone, didn't you? You are right. Sadye changed her name after she married the timeless comedian. 1937 - NBC Radio presented the first broadcast of "The Guiding Light". The program became the longest running story line in daytime drama. The radio show remained until 1956. "The Guiding Light" began its long run on CBS-TV in 1952. 1940 - Mary Martin recorded, "My Heart Belongs to Daddy", for Decca Records. The song was her signature song until she starred in "South Pacific" in 1949. 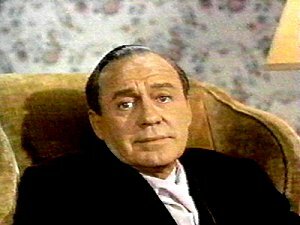 Then Larry Hagman's mother had a new trademark: "I'm Gonna Wash That Man Right Out of My Hair..."
1944 - The character, a black maid named Beulah and played by a white man, Marlin Hunt, aired on radio for the first time on "Fibber McGee and Molly". The spinoff, "Beulah", became a radio series in 1945. 1949 - The first Emmys, the awards of excellence in television, were presented at the Hollywood Athletic Club. Mike Sotkey's "Pantomime Quiz" was selected as the year's top television show. 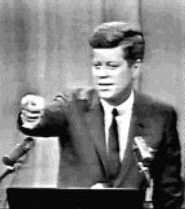 1961 - John F. Kennedy presented the first live presidential news conference from Washington, DC. Kennedy's quick wit made him, "an immediate sensation," according to reporters gathered at the scene. 1964 - The Beatles reached the #1 spot on the music charts, as their hit single "I Want to Hold Your Hand" grabbed the top position in "Cash Box" magazine, as well as on the list of hits on scores of radio stations. It was the first #1 hit for the Beatles. "Billboard" listed the song as #1 on February 1. The group's second #1 hit song "She Loves You" was also released today. 1985 - Heisman Trophy winner, Doug Flutie of Boston College, signed a $7 million, five year contract on this day. Flutie would play with the New Jersey Generals of the United States Football League. The deal made him the highest paid football player and the best paid rookie ever -- in any sport. The USFL would soon fold and players like Flutie joined the CFL; and some went to the NFL.